Independent game developer uCool, known for its free-to-play PC game Tynon, has announced the official release of its first mobile title on iOS and Android devices. The game is Heroes Charge, and it’s described as a hybrid between a role-playing game and a multiplayer online battle arena title (MOBA). In Heroes Charge, gamers have access to over 50 heroes, from archers to mages, and can take those characters into battle across multiple gameplay modes. Players begin with just a few characters in Heroes Charge, and are thrown into the level-based missions of the single-player campaign. Each mission requires stamina to begin (which recharges automatically or can be purchased), and is listed alongside any available loot drops and the enemies one should expect to encounter, including bosses. 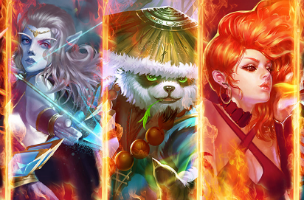 Players can tap on these enemies to learn more about them, and use that intel to choose the best team of five heroes possible to take into battle. Once the battle has begun, both enemies and heroes approach the middle of the battlefield and attack automatically. As heroes attack, their special power meters charge. When full, players can tap on the hero’s portrait to unleash a powerful move. Battles are timed and contain multiple waves. The better the player’s performance in each stage, the more stars they’ll earn (up to three per level). At the end of combat, heroes receive individual experience points, the player receives overall experience points (increasing their maximum stamina and maximum hero levels, as examples), and players receive coins that can be spent on chests that contain hero recruitment items. Users can also equip their characters with their newly acquired gear (if they earned any). Each hero can be outfitted with six pieces of gear. When fully equipped, they’re eligible for promotions to become even stronger characters. This increases their stats, gives the heroes new skills, and resets their gear slots so further promotions can take place. It should be noted that gear can only be assigned to specific, matching characters, so simply collecting six individual units of gear doesn’t guarantee a promotion for a hero. Outside of the game’s single-player campaign, users can take their heroes into the Arena, Trials, Crusade or Guild Campaign modes to access multiplayer content. These modes are level-locked, and won’t begin to open for gamers until they reach at least Level 10. The game is supported by premium currency, which can be spent on premium chests for new heroes, and other premium content. During the game’s soft launch period, it surpassed five million players and accumulated 80,000 player reviews. The game’s latest iOS version has a score rating of 4.5 stars. Heroes Charge is available to download for free on the iTunes App Store and Google Play.